In previous blog “Coalgate…” I touched on the topic of Dutch Disease. The concept of Dutch disease rebounds me to the interdependent co-arising once again (interdependent co-arising means – we are all dependent on each other.). This concept of Buddhism is applicable in every walk of life. If we (each individual) do not understand it we are going to remain in the problems we face. Check previous blogs on the same below. Interdependent co-arising farmers example (ground level example) – this blog is about how interdependent co-arising relates to a smaller level of activity of one businessman / farmer. This could be you or me in our regular work environment. 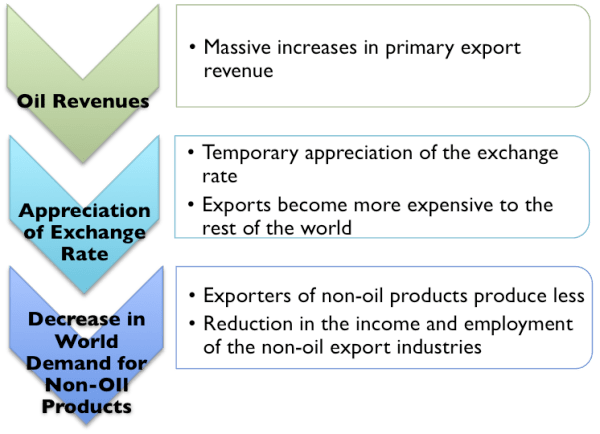 Interdependent co-arising macroeconomic example (world level example) – this blog is about how interdependent co-arising relates to macro-economics. This blog is a country level example of interdependent co-arising (Pali original concept – Pratītyasamutpāda – at Wikipedia). The inflow of capital leads to an appreciation of the currency, making imports cheap and export expensive. The name comes from the Netherlands experience following the discovery of gas in the north sea. Natural gas sales drove Dutch currency up, seriously hurting the country’s other exp ort industries. In late 50’s Netherlands found huge source of natural gases. This resulted in 1. investments (largely foreign direct investments) in that sector 2. decline in other sectors e.g. one example could be people moving for jobs in that sector (consider Indian IT sector as reference) 3. investments (specially foreign investments) in that sector resulted in stronger currency. The excessive investment made Netherlands currency stronger resulting in making exports expensive eventually resulting in decline of export from Netherlands. Manufacturing suffered and thus jobs in manufacturing too go to step 2. This convoluted – action/reaction and impact at not so obvious industries – example again suggests to us that even if industries are not linked directly they are linked in some way. This link is interdependence. This interdependence should make one value the existence. The “Dutch disease” should make us once again think about the invisible connections we share with each other.